Wash twice and Soak the moong dal for an hour , you can also soak it for overnight it will reduce the pressure cook time. Heat up oil in pressure cooker add mustard seeds , a pinch of asafoetida ,cumin seeds, curry leaves and crackle them, add ginger garlic paste and cook it till the raw aroma of ginger garlic disappear. Now add dry red chilies and sauté for a min add chopped onion cook till onion turns golden brown. Add garam masla,red chili powder, turmeric powder mixed it well. Now add the soaked dal and mixed it well, add water, salt and pressure cook it for 8-10 whistle. 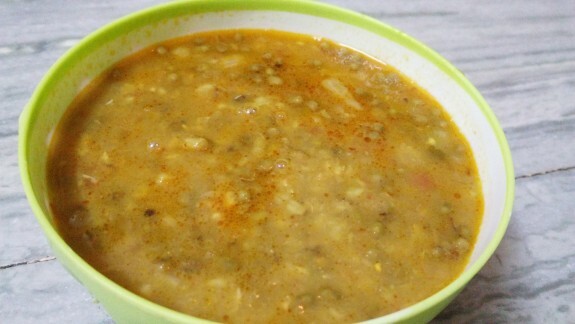 Now open the cooker when it settle down add some water if constancy of dal is thick, Do not add to much water cook it for a 2-3 minutes on low flame and the spicy Panjabi style Khade mong dal recipe is ready to serve. Serve it with stem rice or chapatti.